In today’s heterogeneous storage environments, storage resources may be spread across on premises data centers or cloud storage pools ranging from proprietary storage systems, Windows servers and open storage systems running on Linux. For this reason a backup strategy needs to account for the various types of critical information that must be backed up segmented by business function such as legal, marketing, finance, engineering or health and medical data. Within QuantaStor you can create backup policies that will automatically backup CIFS/NFS shares on your network to your QuantaStor appliance. Whether the share is on a 3rd party NAS filer, Linux, Windows, or other server presenting NFS or CIFS shares, QuantaStor Backup Policies make implementing a DR strategy easy. To create a backup policy in a QuantaStor appliance right-click on the Network Share where you want the data to be backed up to and choose the ‘Create Backup Policy’ option (Figure 1). From here you’ll select the CIFS/NFS share on your network to be backed up, and the times at which you want the backup jobs to run. When the backup policy runs it will attach to the specified CIFS/NFS share on your network to access the data to be archived. When the backup starts, QuantaStor creates a “Backup Job” so you can track the progress of any given backup. 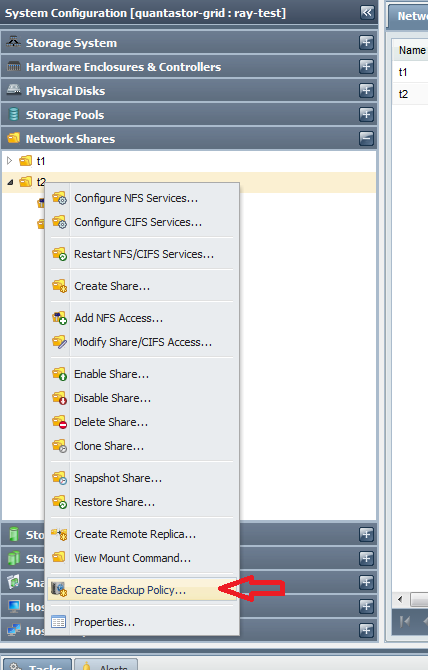 Simply select the Backup Jobs tab in the center-pane of the web interface after you select the network share to which the backup policy is attached. Backup policies in QuantaStor also support heavy parallelism so that very large NAS appliances with 100m+ files can be easily scanned for changes. This feature was specifically designed for a life sciences company that had so many files (over 300m) that they could not scan the entire data set within their backup window using traditional backup products and techniques. By default, QuantaStor backup policies use parallelism (up to 64 concurrent “scan+copy” threads) and has a major impact on reducing the backup window for Big Data scenarios. Backup policies back up everything by default, but you can also opt to back up only recently created files and modified files using a ‘Sliding Window Backup’. When backing up data from Big Data archives with hundreds of millions or even billions of files it is sometimes useful or necessary to only backup and maintain a data subset. This is especially helpful for scenarios where there’s more data to be backed up than may be available in your QuantaStor appliance. For example, if you set the data retention period of your Backup Policy to 60 days then all files that have been created or modified within the previous 60 days will be retained. There’s also a purge rule that by default is set to remove files that are older than the retention period from the backup folder (Figure 2). 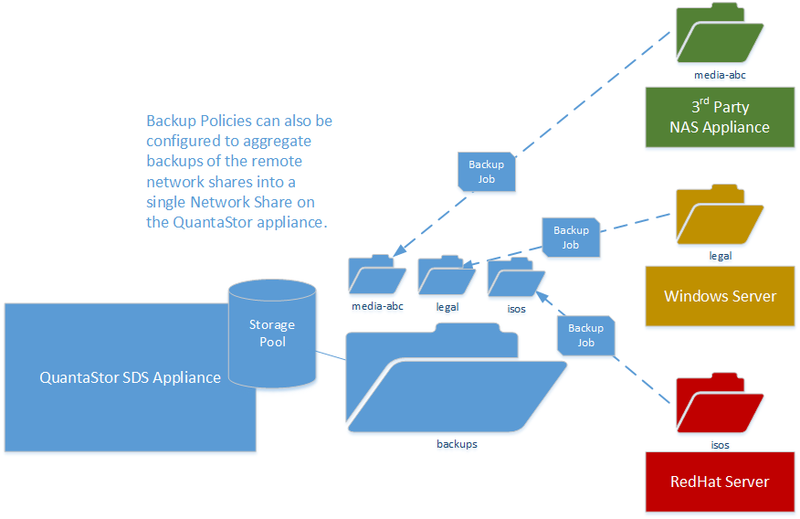 Backup polices can also be configured to automatically consolidate or aggregate storage backups from remote network shares into a single network share on one QuantaStor appliance based on departmental data to comply with compliance-mandated storage retention policies (Figure 3). With your Backup Policy in place and running automatically throughout the day you can then use various techniques to failover to a QuantaStor SDS appliance in the event of an outage of a NAS appliance. The easiest is to make a DNS change to assign the IP address of the NAS filer’s hostname (/ FQDN) to the QuantaStor appliance. This will map all existing client connections to the appliance in a transparent manner. The other option is to reconfigure the clients manually to have them reconnect to their network shares using the IP address or hostname of the QuantaStor appliance where the backup copy resides, but that’s less efficient if you are supporting many clients. For more technical information regarding automated backup policies and disaster recovery please visit the QuantaStor Administrators Guide on the OSNEXUS Wiki.